When you install Microsoft System Center 2012 R2 Service Manager and open the console, one of the first things you see are some default views for Incident Management for Support Groups based on the default supplied Tier 1, Tier 2, Tier 3 list items. 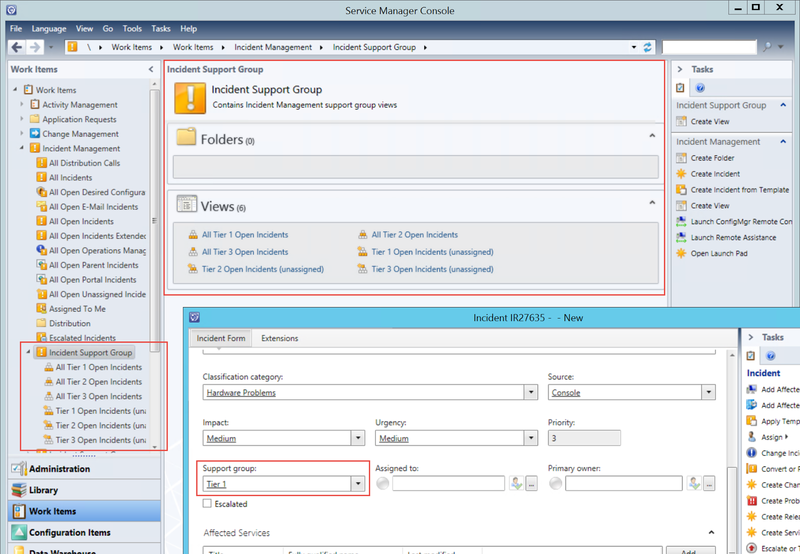 This is to give newcomers at least a bit of a view of how you can start to organise the system, however these are supplied as part of the default ServiceManager.IncidentManagement.Configuration management pack are can't just be deleted from the console as the list enums are linked to some of the default Templates as well as the views. However... I've never been a fan of doing things manually and after forgetting to remove them the other day and having an issue after importing a custom management pack, I thought I'd try to make the process easier. So I've uploaded a PowerShell script to the TechNet Gallery that automates the process. Bear in mind that updates and future versions of Service Manager may replace this management pack and add the removed items back. If they do (and things haven't changed too much) you should only need to re-run this script to remove them again. Please test this script first in a non production test environment. While it works for me, I cannot take responsibility if it damages your environment.